Lenka has graduated at the Czech University of Life Sciences in Prague, the course of Cynology. In this time, she is studying master degree Animal Breeding at the same university. Lenka has grown up with animals, she spent her free time in the ranch. She trained dog assistance dogs and helped in a shelter in Troja and in military cynology centre. Lenka can take care of small or large dogs, she has experiences with care, training and socialization of them. 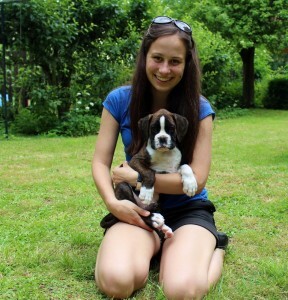 Lenka can take care of your dog in her flat in Prague 4 – Chodov or her cottage with garden in Czech central range.